It's G.I. Joe versus Cobra in a brand new way in this awesome Construction Commandos pack! This exclusive pack includes a figure that looks like Sgt. Slaughter, G.I. Joe's premiere drill instructor and special forces leader. He commands a highly specialized attack unit that hits Cobra forces head on! Your Gabriel "Barbecue" Kelly, Spirit Iron-Knife, Low-Light, and Andrew "Footloose" Myers are armed to the teeth and ready to mount a full-scale assault against the forces of evil! You and your G.I. Joe commandos will cover yourselves in glory with every mission – and you'll need it, because this pack also includes pieces for Iron Grenadiers KREONs. The Destro figure leads his evil minions: Voltar, Darklon, Iron Grenadier Officer, and Iron Grenadier Trooper. The battle is going to be immense, because both forces come with their very own tank! Bring it on with the Construction Commandos pack! Formerly a convention exclusive. 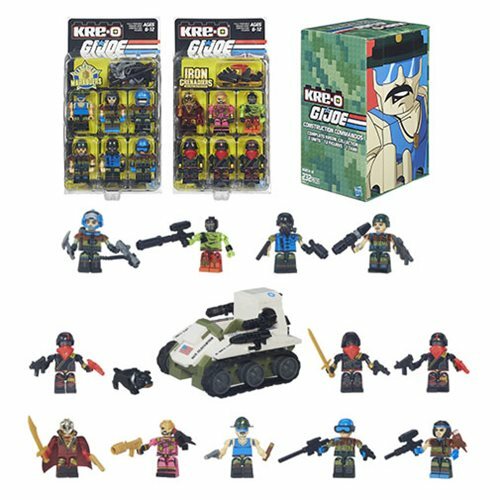 Set features VHS-stlye packaging with 12 Kreon mini-figures and 1 vehicle, plus accessories. Ages 6-12.